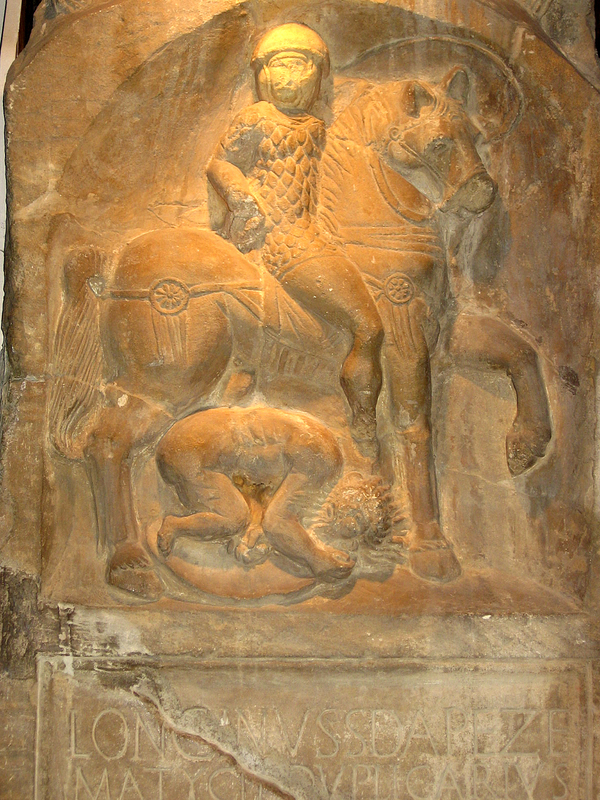 Tombstone of Longinus Sdapeze, a junior cavalry officer of the First Cavalry Regiment of Thracians. Western capital of the Trinovantes tribe conquered by the Romans in AD 43 by the Emperor Claudius and General Aulus Plautius during the invasion that led to four hundred years of Roman rule in Britannia. Was the site of the first Roman fort in Britannia and shortly after was made the first colonia, a town for discharged veterans. Attacked and razed to the ground by Boudica and rebels from the Iceni and Trinovantes tribes in AD 60. An estimated 10,000 people were killed in the attack on Camulodunum. Site of a large temple dedicated to the Emperor Claudius and to the Imperial cult. Citizens of Camulodunum took refuge in the temple during the Boudican revolt and were killed when the temple was burned down. The concrete foundations of the Roman temple of Claudius upon which the 11th century Norman castle housing the museum is built. Tombstone of Marcus Favonius Facilis, a Roman centurion of the Twentieth Legion. Gosbecks Mercury, a small bronze statue of Mercury. The Colchester Sphinx, a small statue of a sphinx with a human heads between its claws. The Colchester Vase, depicting hunting and gladiator scenes. Behind the museum are the remains of tiled floors of Roman town houses. The Balkerne Gate, the western entrance double arch to the fort along with a circular guardhouse. Tall length of wall lined with red Roman bricks runs along the A134 Balkerne Hill road.